Of all the nasty tricks that can happen to someone who is trying to eat healthy, the worst is living near Durrant’s Crown Bakery. Whenever Mike and I walk within four blocks of their building, we can smell what they are baking. Most of the time, the air smells thick with the fragrance of donuts. Just last week, it smelled like white powdered donuts with raspberry filling. The smell was that distinct. Our mouths watered, but we could not eat the donuts. It wasn’t worries about our health that kept us from partaking of the mouth-watering donuts that we could smell from across the street. In fact, a donut treat every now and again can help stave off the feeling of deprivation when it is planned for. No, the reason we can’t eat the donuts is far more cruel. It is the fact that we can’t buy them. Durrant’s Crown Bakery sells their treats to gas stations and convenience stores in the area. We have walked up to the door of the building many times, but there is no way to buy their treats directly from the source. We have to wait until they are stale and tasteless in the convenience store. I honestly believe that if I could eat their pastries fresh from their bakery, they would be delicious, but every time I have purchased a Durrant’s Crown Bakery treat from a gas station, I’ve thrown it away, half-eaten. By the time they get to the store, they are stale. The half-life of utterly delicious pastries is something on the order of six hours. By the time their wares are packaged and delivered, they are about as tasty as the cellophane they come in. 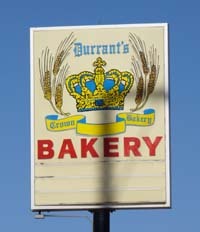 Durrant’s Crown Bakery is truly the most nasty trick played on a healthy eater in Salt Lake City, Utah. This article on Happy News makes me nostalgic about food and candy. My grandma used to love the Idaho Spud candy bars. I have no idea if these are available outside the western states surrounding Idaho, but they taste very good. The exterior is a waxy, cheap chocolate with coconut. The insides of the candy bar taste like a combination of maple and marshmallow. It almost melts the moment it hits your tongue. My grandma used to love these candy bars. They were a special treat and she wouldn’t share. My memories of her eating these candy bars is in complete conflict with her personality. She was obsessed with dieting. She was obsessed with making us be on a diet. There was a time when I had to share the last boiled potato with my grandma. I was so hungry that it was the most delicious potato I’ve ever tasted in my life. How can I equate that grandma that shared the potato with me and the one that obsessed over Idaho Spud? It’s not like she was bingeing on the candy bars. They are difficult candies to find in Montana. Yet, she was all about denial. She wasn’t at a healthy weight when we were up in Montana, and she never lost weight while she was up there. Was she quietly bingeing in the middle of the night when we couldn’t see her? I learned my bingeing behaviors from my dad (her son). Did he learn this behavior from her or because of her? Eating behavior is such an “in the closet” thing. There is so much about my grandma and my father that I just don’t know and I have no desire to ask about it. She died years ago and I rarely speak to my dad, so I guess it will all just stay in the closet. It’s such a private thing that I can’t even talk to my dad about it. 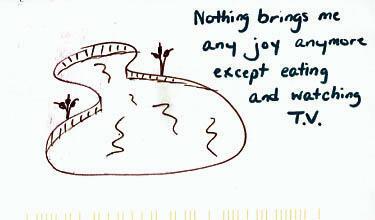 Before I even read the words on this PostSecret postcard, I knew that it was saying something to me. I’ve never truly been skinny for a long time, so I haven’t had the constant yo-yoing in my life, but it’s true. 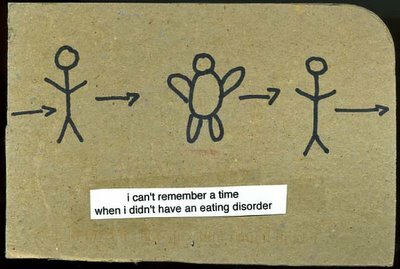 I can’t remember a time when I didn’t have an eating disorder. I have only about three or four memories from before the day that I decided I was fat. Sometimes I feel like having a bingeing problem is so interlaced with my personality that I will never be able to be free of it. Sure, I can count the binges in the last few months on my hands, so the problem has dimished to the point where I can be healthy, but it’s still there. Do I just live with it for the rest of my life or is there a way to actually free myself of this pattern? I refuse to believe that I have to fight bingeing for the rest of my life. I have to hold on to the hope that I will someday be able to finally conquer the feelings that cause this pattern. The more I learn and grow, the closer I get to that point every day. As I was reading this restaurant review, imagine my surprise that the national news was doing a review of a restaurant in my hometown of Salt Lake City. I was even more surprised when I found out that the cafe in question was just down the street from my house. Of course, Mike and I ate at the restaurant the next day. Mike ordered the Hummus on Romaine Lettuce Leaves and I ordered the Falafel Salad. I was curious to find out how they were going to manage making Falafel without frying it. It turns out that they dehydrate the Falafel until they are like thin crumbly chips. The food was excellent. The story was repeated within our presence. Mike and I waited at the table for our order and listened to Omar tell the mystical story of his conversion to Raw Food. He made it sound like a religion. He was visited in a dream by a woman he had never known before. In the dream, the woman handed him a book. Later, Omar realized that the woman from his dream was a real live woman. At this point, all of this sounds like an elaborate pick-up line. It went wrong for Omar, however, because the woman was married. She DID hand him a pamphlet on Raw Food, though. That was the moment that changed his life. 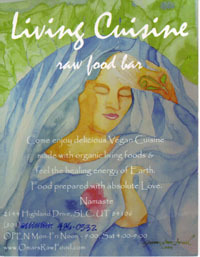 He gave up on his geophysicist training and ended up in Salt Lake City, Utah, opening the Living Cuisine, Raw Food Bar. As far as the food goes, it tasted really good, but we didn’t see Omar prepare it. There were two employees in the back making the food. Omar seemed to be the “personality” of the cafe, talking up the customers and telling his story. Our trip to Living Cuisine was an interesting one. I always find it fascinating when food and religion become so intertwined that they become one jumbled mess. It’s like dinner theater and the Gospel Brunch all mixed in one. Stay back when starting a group exercise class. When joining a new group exercise class with detailed choreography, stand near the back of the room and let the experienced group workout near the front. Apparently, the rules are when you don’t know what you’re doing, you should stay at the back of the class “where you belong” instead of trying to get close to the instructor so you can see what’s going on. I broke this unspoken gym rule, so the brown-haired girl thought it was acceptable to make fun of me. She didn’t think I was “good enough” to be at the front of the class. I just wanted to be able to see what the teacher was doing since I had never taken that class before. If you’re not a hard body, don’t even think about seeing the instructor. Only the best deserve to be at the front of the class. You’re safest if you just use the cardio machines and leave as quickly as possible. You better not show your disgust at the grunting he-men on the weight machines, even if they don’t wipe off their sweat. Telling the instructor it’s your first time taking their class is just showing weakness. You’re here to get strong, not special instruction. Ok, I’m finished complaining. It just makes me mad that the brown-haired girl felt justified in making fun of me when I was just doing the best that I could. Gyms are anything but nuturing environments. I wonder why I keep paying the monthly membership. 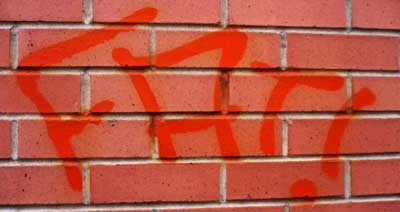 I saw the graffiti on the wall and felt the shame. FAT! It was a word that was used to torment me all through grade school. Seeing it there, on the wall was like a stranger had made a judgment call across the space-time continuum. I felt that whoever sprayed that word on the wall knew I was coming and made it known that there is something wrong with me. I tried calm myself down as I headed to my destination. There is no way that the graffiti was trying to torment me. It was sprayed there less than a week ago, but the tagger couldn’t have possibly had me in mind when the can colored the wall. That word on the wall had nothing to do with me. It still stung, though. It was like the wall knew I was coming and said exactly what it was thinking. When I tell people that I used to be fat, they are surprised. I can almost tell what they are thinking behind their eyes. They think that I was fat for a little while and I got over it like most people get over the flu. There was some sweating and discomfort, but now I’m all better. I’m here to tell you that it wasn’t like that for me. I was fat before I remember being myself. I think my personality came into being the day that I realized that I was fat. Fat is so much a part of me that I see the word on a wall and identify with it so strongly that I think it was placed there specifically for me. I don’t know if fat will ever leave my psyche. Maybe I’ll spend the rest of my life feeling bigger than my body. On the way home from my appointment, I stopped and looked at the wall. I pulled the camera out of my purse and clicked a few pictures. I decided that if I identify with the word so much, I might as well take it into myself and make it positive somehow. I don’t know how, but that’s the goal. The treadmill is great, but nothing can replace a run outside. I have been running on the treadmill for a few months now. When the weather got unbearably hot, I started using the treadmill and I didn’t try running outside again until yesterday. I forgot how much the wind blowing in my face can affect my run. I forgot how bad it feels when someone passes me on the track. I forgot how good it feels to finally pass someone else. 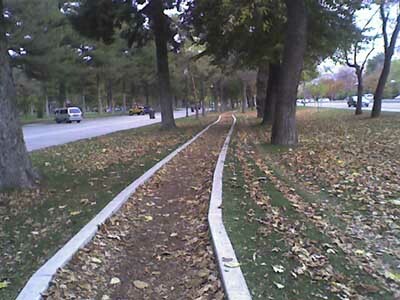 It’s getting cold here in Salt Lake City, but I think I need to add an outside workout at least once a week. The treadmill has made me a little soft, I think. 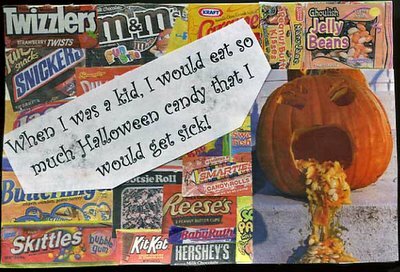 So many of these PostSecret entries hit home for me. There was a time when I knew I had chosen the wrong path. I didn’t really see a way out, so I finished up my worthless college degree. During that time, I gained about thirty to forty pounds. I didn’t step on a scale the entire time because I was so stressed out trying to finish student teaching, but I think I gained about thirty pounds during that time. The only entertainment that I allowed myself was taped episodes of Star Trek: The Next Generation. I might have felt better if I had exercised or cleaned up the apartment, but instead, I zoned out in front of the television. That was a really hard time in my life. How did I get out? How did I find a life full of joys other than food and TV?